There doesn’t seem to be such a thing as chance encounters for Amsterdam-based architect Uri Gilad, partner at Office Winhov, and Anomaly partner and chief executive, Engin Celikbas. Everything seems to happen for a reason, including their introduction at a mutual friend’s wedding years ago. Their friendship would soon turn into a business partnership, bringing together their expertise in an unusual way. A fascination with transformation is what binds them; in Uri’s profession, it manifests itself in more physical forms, while Engin works in the business ecosystems that surround change. It is this fascination that fueled their collaborative work: the refurbishment of a historical telephone exchange building and a former bank behind Dam square into an impressive and visionary hotel complex that is the W Hotel Amsterdam, complete with a two-store shopping venue showcasing the city’s leading talents in art, fashion and design. 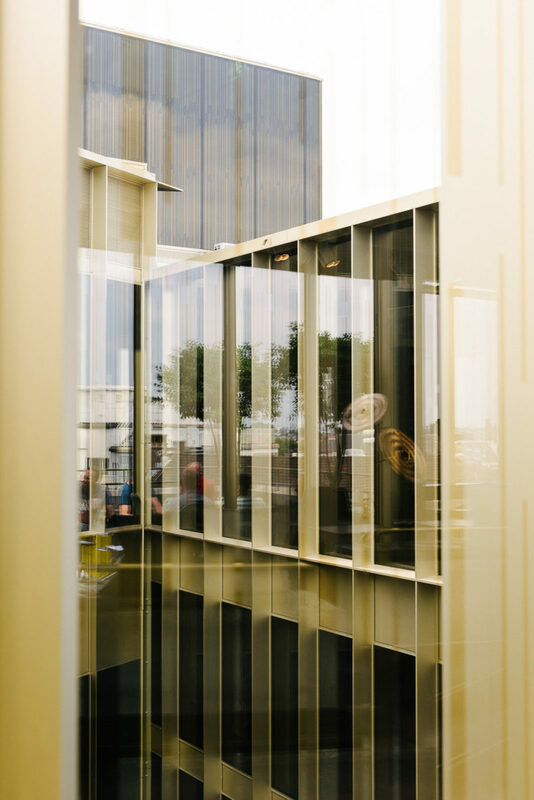 Embracing the historic past while retaining many of the original features, the W Hotel echoes the current approach to transformation in a city that has welcomed change for centuries. Tell us a little about what Anomaly does. Engin: At Anomaly, our core business is helping brands to cope with change in a world where taxis are replaced by Ubers, hotels are replaced by Airbnbs, and video stores are replaced by Netflix. Earlier this month, Nokia’s CEO Stephen Elop said, “We didn’t do anything wrong, but somehow we lost,” to which people commented, “They didn’t do anything wrong, however, the world changed too fast.” This line of thought led Carl Johnson and his partners to set up Anomaly 12 years ago, and it’s something that is as relevant today as it was when the company was founded. There are quite a few changes taking place in Amsterdam. Let’s talk about the ever-changing urban environment. Uri: The first thing that comes to mind is the transformation of the Wibautstraat in the east of Amsterdam. Until not long ago it was considered one of the city’s ugliest streets. But change was instigated on two levels: the first was as a programmatic change. When the office of national newspaper The Volkskrant left the Wibautstraat in 2007, creative types were quick to establish workspaces and studios in the empty building. A restaurant soon took over the top floor and a club opened in the basement. A few years later, the creative hotel Volkshotel opened; it still houses artist studios in the back wing of the building, a restaurant on the top floor and a club in the basement. Although the building now has a different purpose, the quality remains intact; it could be transformed back into an office building with very little effort. All the while, the city of Amsterdam decided to upgrade the existing street profile and transform it into a boulevard of sorts, with a line of trees in the middle of the road. Thanks to these investments, the whole area, including the adjacent neighborhoods, started to change. E: Across the street from the Volkshotel is The Student Hotel, a very interesting concept when you think of the question, how can you make every square meter count? Students need housing for a short amount of time, and the city needs hotel rooms to accommodate all the tourists—why not combine the two? 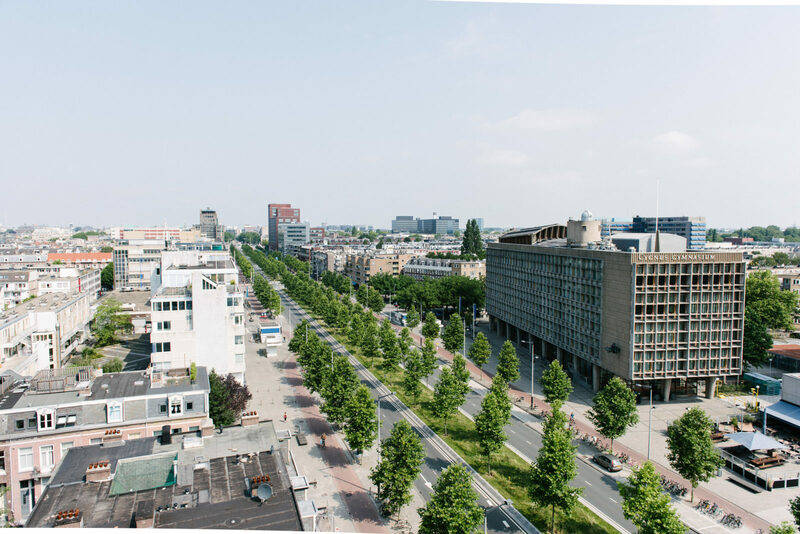 A view of the tree lined boulevard Wibautstraat from the Volkshotel: An example of Amsterdam's constant urban evolution. The former office block today houses artist studios, a top floor restaurant, and a basement club: all part of the Volkshotel. The colorful and creative workspaces that sit at the base of the Volkshotel. "Students need housing for a short amount of time, and the city needs hotel rooms to accommodate all the tourists—why not combine the two?" says Uri, discussing the development of the Student Hotel. Uri, further down the Wibaustraat your office is working on the renovation of the Amstel Station. Can you tell us more about this project? U: There are many challenges at the station. For example, how do you renovate one of the most beautiful stations in Amsterdam but create enough space to accommodate approximately 6,000 bicycles? At the same time, we’re restoring the eastern side of the station and creating a new space to accommodate the increased amount of traffic coming from the west due to the housing and business developments at the Amstelkwartier. There’s a lot happening in the east! What do you think is responsible for the change in Amsterdam East? U: It definitely helps that the City of Amsterdam has been so involved in this area. With more parties working together, you can heighten the chance of success. A good example is the former nightclub Trouw (what is now The Student Hotel). The clubs’ founders worked with the municipality to temporarily change the zoning to allow for the club to operate. This resulted in more traffic to the east, especially amongst a young generation who might not have been to the area before. We see the same thing happening in the western part of the city right now with the new club De School. I actually participated in a workshop recently with the municipality and numerous developers and social scientists [Mv1] to examine the possibilities to transform the whole area around De School. So west is now the place to be? U: I guess you could say that Amsterdam is expanding to the east and to the west. The area around the Jan Evertsenstraat in Amsterdam West is an interesting example because it was built as social housing in the early 20th century, in the architectural period known as the Amsterdam School. Architect Berlage, one of the most prominent ‘members’ of this school, often designed small commercial functions in the plinth of each residential block; these functioned as social control stations on the corners of the streets. Today, popular restaurants are taking these important positions and instigating change in the area. E: I was actually born and raised in this area of the city. I remember it was a pretty OK area in my early years but really deteriorated in the 1980s. Now it’s quite popular again. It’s a really nice representation of transformation: The original characteristics of this typical Amsterdam School architecture are still visible yet contrasted with new wave tourists occupying Airbnb apartments. "There are many challenges: how do you renovate one of the most beautiful stations in Amsterdam but create enough space to accommodate approximately 6,000 bicycles?” Uri discussing his redesign of the Amstel Train Station. What do you prefer: new or old? E: I think we work according to a three-fold matrix of change: old building—old proposition (not interesting), old building—new proposition (very interesting), and new building—new proposition (can be interesting). The old building—new proposition combination often presents us with exciting challenges; sometimes you change the program but you have to accept the cards you’re dealt with. Was this the case with the W Hotel? U: Yes, for the most part. 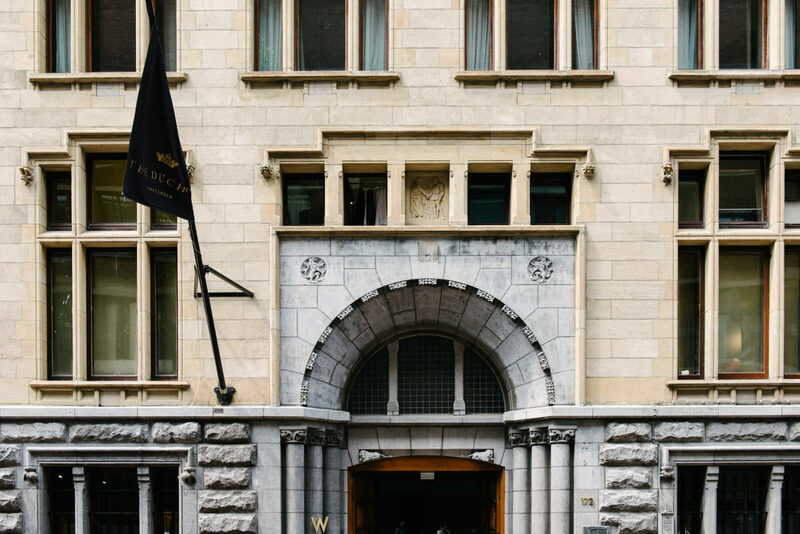 The two buildings that make up the W Hotel are both monuments: the historical telephone exchange building (the W Hotel ‘Exchange’) and the KAS Bank (now known as the W Hotel ‘Bank’). We decided from day one that we were not going to change the façades of the buildings. We weren’t going to construct a large entrance to the Bank because one, we weren’t allowed to, and second, I don’t believe in it as an architect—if in 100 years they want to change the building back into a bank then they should be able to. For the W Hotel Exchange we asked ourselves if we could create an upside-down hotel, or a hotel that had a lobby, a bar and a restaurant on the top floor instead of the ground floor. We were told it was ridiculous, but you should see it today: everyone wants to go up! E: What you guys did was add a market-place of sorts on top of the building; you created a new Dam square [laughs]. The transactions, the dining, the socializing… Everything happens on the top floor, it’s genius. What’s the story behind the X Bank? E: The X Bank store was actually the answer to negative transformation, the result of the gentrification of the neighboring shopping streets the Nine Streets. I had read an article a few years before, ‘De verdriet van de negen straatjes’, or ‘The sadness of the nine streets’ that highlighted the sentiment that we’re losing the unique shops that made the streets special. With X Bank we’re bringing that back. Everything you see here was created by ‘home grown talent’, or artists, entrepreneurs and fashion designers who studied, worked or lived here. Inspired by Dutch creativity, you can’t find this collection anywhere else in the world. The street where Engin was born, a typical example of traditional Amsterdam School of architecture. Architectural details: an external staircase for use by the second floor occupants only. The angular concrete features of the buildings we passed on our drive. 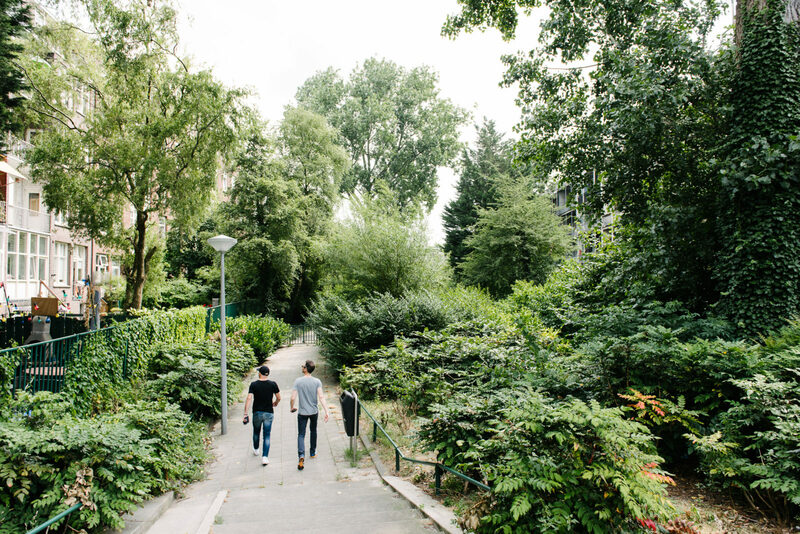 Engin takes Uri to his favorite secret garden hidden between the buildings in Amsterdam West. The historical Kas Bank building is now the site of Engin and Uri's collaborative project: The W Hotel 'Bank'. Uri designed an inverted hotel, the lobby and the restaurant sit at the top floor, instead of at the bottom. The rooftop pool of the W Hotel overlooks the historical center of Amsterdam. Uri and Engin at lunch with Alon Baranowitz and Irene Kronenberg—the interior designers of the W Hotel and X Bank. "The X Bank store was actually the answer to negative transformation, the result of the gentrification of the neighboring shopping streets the Nine Streets." 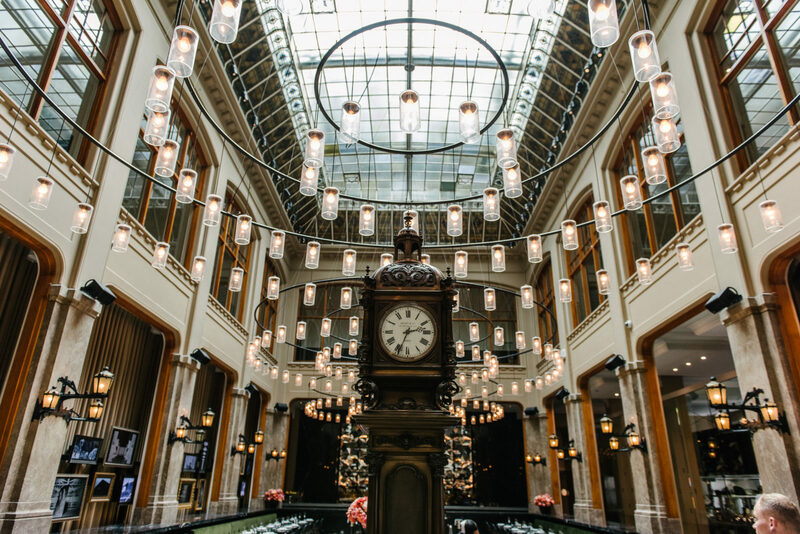 The former bank was transformed into a public place that serves the city, the monumental hall was restored and is now used by a restaurant called The Duchess. Did you first meet when working together on the W Hotel project? U: We actually met years before we started working together. It was a lot like a date (laughs) – our mutual friends set us up at Liran Wizman’s (Owner and CEO of STAG Europe) wedding. He’s actually the owner of the W Hotel, which is quite a coincidence. As long-time residents in Amsterdam, what do you think is driving the transformation of so many buildings in the city? U: There are many empty public buildings that are no longer used for their original functions (like post offices, banks and city halls, for example). Luckily the municipality is very aware of this development and looking for creative solutions. The KAS Bank, for example, worked with the municipality to make sure the building was sold to the right people with the right ideas. This is something we see happening quite often. E: Several trends are taking place at the same time. We have a city that understands and facilitates change, that’s ripe with economic prosperity, and that’s experiencing an influx of visitors, workers and companies. And unique to Amsterdam is the appetite for creativity. We’re home to concepts like The Student Hotel, [hotel brand for traveling professionals] Zoku, [luxury hotel chain for the mobile citizen] citizenM, and [creative office rental concept] Spaces. These are all ‘home-grown’ concepts that can compete on an international level. It says a lot about what’s happening in Amsterdam right now. Is there one thing, you think, that distinguishes Amsterdam from other major European cities? U: I’d say Amsterdam is a lot more grounded. We’re all biking to work, wearing our sneakers, and grabbing a beer after work. Take the Dutch saying, ‘Doe maar normaal dan doe je al gek genoeg’ [which literally means ‘Just act normal, that’s already crazy enough’]. The Dutch are often critiqued for this, but I think it’s also the beauty of Amsterdam. There are always two sides to the same coin, right? for showing us the changing city that is Amsterdam! Find out more about the work of Office Winhov and Anomaly. A big thanks also goes to Mercedes-Benz, who supported our trip to Amsterdam and the city tour with Uri and Engin. Inspired to plan your own getaway? Flick through our travel stories or meet personalities from the Netherlands, Germany, Austria, Switzerland and more in our archive.